Throughout history, changing times and technology have altered innumerable traditional cultures all over the world. By the 1980s, this process was accelerating, as the world became more globalized, technology surged forward, and peoples and nations became more economically connected. Such drastic change brought many benefits, but also some destruction of traditional ways of life. The Columban Fathers and Sisters had a long history of working with marginalized, less developed indigenous groups in their various nations. 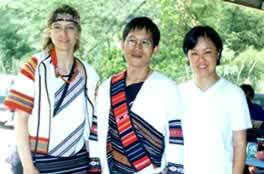 In 1987, the March and May/June issues of Columban Mission magazine highlighted decades of Columban mission work with indigenous peoples, like the Atayals of Taiwan, the Mapuches of Chile, and the Subanen, T’Boli, and Igorots, of the Philippines. The magazines discussed economic projects, environmental protection and other endeavors that the Columbans organized with indigenous peoples, including the sale of Subanen and T’Boli crafts. In the difficult changes that globalization brings to traditional cultures, the Columbans are on hand to make the transition easier.